Patrick Yandall is undoubtedly a productive musician. In the short period of his solo activity he has already released That Feels Nice (1994), A Lasting Embrace (1997), Of Two Cities (2000), Back to the Groove (2002), From The Ashes (2004), Eyes Of Mars (formerly titled Just Be Thankful (2005), and Samoa Soul (2006). One could almost certainly describe Patrick as a smooth jazz guitarist. Until this year. 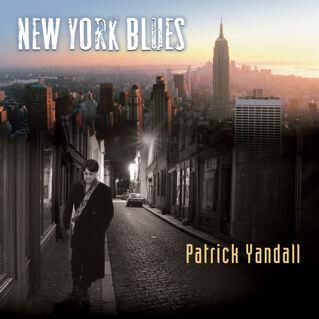 Patrick Yandall has released his first Blues album titled New York Blues (2007). What does a guitarist motivate to produce an album in a totally other genre? Well, first of all Patrick has always referred himself to his Blues roots and influences especially in the notes of his previous albums. Patrick answers: "I did New York Blues as a blues rock CD because my live shows always incorporate that vibe and it always seems to go over well." So it's a natural process that Patrick did the Blues. The album is completely Yandall's work: he performed all instruments, has written with the exception of three tunes all songs, produced and engineered the CD. When I first heard Wrap It Up I said to myself. You know that track. Well, it reminds me a bit on Jimi Hendrix' All Along The Watchtower. Yandall bursts out with great energy. His kicking distortion guitar is burning like his rough voice. Slowing down New York Blues awakes another association. Godley and Creme's "Golden Boy" has a similar diction. Deeper into Blues walks Blues For Buddy. Lead instrument is the guitar while the Hammond B3 only plays the role of a water carrier. For the solo guitar track So Low Patrick uses a play on words. Only on the final bend further instruments set in. People Get Ready was a smashing hit of the group Impressions in 1965, penned by the legendary Curtis Mayfield. The song became an anthem of transcendence for the civil rights movement and an oft-covered soul standard. Now the lyrics aren't in the foreground but the melody perfectly covered by Patrick Yandall's pleasant-sounding guitar. Patrick rocks on Fire In The Hole like good old Ten CC. The Blue Room slows down the tempo again. A little Blues a bit of smooth jazz; relaxing on a hot summer's day. Patrick returns to the upbeat Blues with There's Blues In This House. That's certainly stuff for live sessions. Frankly said Patrick should rely on his live band recording his albums. I am sure impulses of other musicians would be a good enrichment. In Memory Of Elizabeth Reed was originally recorded by The Allman Brothers Band for the album Idlewild South (1970). During the tune Patrick accelerates the tempo of his interpretation to a rockish version. Rough in style with his distortion guitar and the Hammond B3 sound. Shakeys Blues reminds me at Eric Clapton's music. I love this guitar sound. Timeless good. Deception Point has some tricky phrases and very rough solo guitar moments. Cause We've Ended As Lovers penned by Stevie Wonder is an amazing classic. Many artists such as Jeff Beck, Eric Clapton, Chieli Minucci, Gato Barbieri or the Crusaders were attracted by its magic. Patrick's version has that Carlos Santana timbre. Awesome. New York Blues is an album for guitar lovers. A dedication to the Blues, but also a demonstration of Patrick Yandall's versatility.